Nothing says Fall like a warm, sweet and buttery apple crisp! I’ve been making my favorite recipe for apple crisp ever since I found it in Gourmet’s October 2002 issue. My daughters were 11, 9 and 5 at the time and they and a few of their friends piled into my minivan (boy, how times have changed!) and off we went for our annual apple picking excursion to Dr Davies Farm. Every year the girls would help me prepare — and eat! — a big batch of our favorite, slightly orange-scented and deliciously sweet apple crisp. Today is my youngest daughter’s 21st birthday. (Happy Birthday Jolie!!) In honor of this special occasion, in which she is now legally able to drink wine, I am pairing the apple crisp with a Gewurztraminer from the Alsace wine region. Why Gewurztraminer, besides that I love saying the word (guh-voorts-truh-meener)? Because this exuberant white wine is rich and spicy, full of ginger and tropical fruits like lychee and passionfruit, as well as pepper and cloves. But it also has a strong backbone of acidity, a tartness that cuts through and complements the sweetness of the apple crisp. See some of my favorite Alsace Gewurztraminers, ranging from dry to slightly sweet, following the recipe. 1) In a large bowl, whisk together flour, sugars, cinnamon, and salt until combined well. Add butter and blend in a food processor (or with a pastry cutter, or two forks or with your fingers) until mixture forms large clumps. Transfer to a bowl and work in pecans, if you like, with your fingertips. 3) Whisk together sugar and cinnamon in a large bowl. Peel, quarter, and core apples, then slice 1/2 inch thick. Add apples to sugar mixture along with lemon juice and orange zest and toss until combined well. 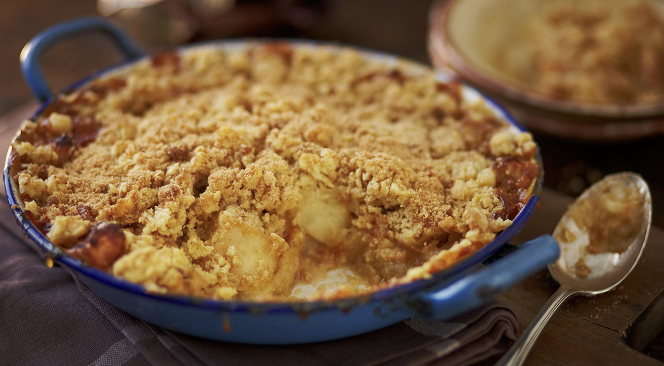 4) Spread apples in a lightly buttered 3.5 to 4-quart shallow baking dish and crumble topping evenly over them. Bake in middle of oven until topping is golden brown, about 1 hour. 5) Cool to warm and serve with ice cream and a glass of Alsace Gewurtztraminer. Hugel “Gross Laüe” 2010 Gewurztraminer ($75). This is one of Hugel’s signature wines. It’s both aromatic and extroverted with floral and spicy notes, yet quite dry. Try it with an assortment of cheeses as well as the apple crisp. Trimbach 2013 Gewurztraminer ($26). From one of Alsace’s most iconic producers, this wine is a beautiful example of a round and rich, dry and spicy Gewurz. Domaine Saint-Rémy 2014 Rosenberg Gewurztraminer ($15). Wine Enthusiast rated this wine 90 points for its “ripe, rounded and generous notes of fleshy stone fruit like yellow plum and ripe peach.” This wine has just a touch of residual sugar. Domaine Barmès-Buecher 2012 Gewurztraminer ($42). The Wine Enthusiast describes this medium-sweet wine as “rich, full of spice with a touch of honey as well as lychee and pomegranate.” A beautiful representative of what Gewurz can be in a capable winemaker’s hands. Domaine Weinbach, Faller Kaysersberg 2014 Gewurztraminer ($40). One of the great producers in Alsace, this wine bursts with ripe, concentrated flavors. Expect some residual sugar in this Gewurz. Domaine Weinbach also makes some spectacular Rieslings.